Abstract: A dermatologist with a special interest and expertise in lasers works with an ex-con to help him gain self-respect by removing offensive and hateful tattoos. Here at the Connecticut Skin Institute in Stamford, Connecticut we celebrate diversity and believe that one of the things that makes America great is the wonderful melting pot we live in. It is hard to believe in this day and age that there are still hate groups that discriminate against others solely because of their race, ethnicity, religion or sexual orientation. Because the holidays are a great time for self-reflection, we felt compelled to share the heartwarming story of a patient we recently treated and how lasers are helping him complete his life transformation. Dominic, a young man who grew up in poverty in urban Connecticut, has spent the majority of his youth in and out of jail. As is the case with most inmates, Dominic was drawn to affiliate himself with a prison gang, in his case a white supremacist group. 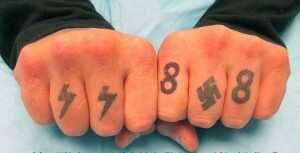 Over time, Dominic not only rose in the ranks of this misguided group but he covered his body with racist tattoos. A pivotal point in Dominic’s life came about when he was transferred to a federal security prison and forced to share a cell with a Hispanic man. At first, they were uneasy roommates but over time their hostile relationship improved and soon they became the best of friends. It was at this point that Dominic began to question the racist values that he harbored for the past ten years. Unexpectedly, after the friendship blossomed, one of Dominic’s gang members was transferred to his federal prison and immediately wanted to become roommates with Dominic. At this point, Dominic’s had an epiphany and decided to leave his gang and reform himself. He became more involved with counselors in the prison and worked on shedding his racist past. Dominic interacted with prisoners of all races, and even after his release continued rehabilitating himself by attending support groups. He turned his life around and aspired to be a role model for his wife and children. Unfortunately, while Dominic has reformed himself from the inside, his exterior still bore tattoos that proclaimed hate all over his body. While he attempted to cover as much of his body as possible, he still had exposed tattoos on his hands bearing some of the most odious symbols known to mankind. It was no surprise that with these tattoos Dominic was unable to keep an honest job. Dominic confided his frustration of his inability to provide for his family with honest work to his social worker who reached out to us. Fortunately, laser tattoo removal invented by my mentors at the Massachusetts General Hospital and Harvard Medical School’s Wellman Center for Photomedicine more than a decade ago, enables laser surgeons to remove unwanted tattoos with a series of treatments. Dominic’s treatments are being done with a state of the art laser made by Lutronic. While helping patients with lasers is gratifying to do, it is extra special when it helps a person get a second chance in life. Author Bio: Dr. Omar Ibrahimi is the founder and medical director of the Connecticut Skin Institute. He is a board certified dermatologist who has completed advanced fellowship training in Skin Cancer, Laser and Cosmetic Surgery. Full Bio. This entry was posted in Omar Ibrahimi and tagged ex-con, laser tattoo, removal, white supremacist by humanemedicine. Bookmark the permalink. True reform always takes place from the inside out. It starts in the head, then moves to the heart. Thank you, Dr. Ibrahimi, for helping this young man to reintegrate himself back into society.